Surface Protection Film | Strouse - More than Tape. Surface protection films are used in many industries where critical surfaces are exposed to scratches and dirt during the manufacture, service, and shipment of final product. During each of these steps in the manufacturing process products are susceptible to scratches, dents, and dings. Surface protection tape is used to protect critical surfaces such as electronics screens, lights, windows and wheels on cars, instrument panels on appliances and much more. Strouse can die cut surface protection films to custom sizes and shapes providing you an easy to apply and easy to remove product that leaves surfaces looking brand new. Surface protection films are used in the electronics, automotive, appliance, medical, aerospace, and industrial markets. 3M 2A804 High Performance Film – For very smooth, high gloss surfaces. 3M 2A825 High Performance Film – For lightly textured or semi-gloss surfaces and or bending, embossing, roll forming or shallow draw processes. 3M 21825 Industrial Polyethylene – For punching, shearing or drilling processes. 3M 87630A Surface Protective Tape for Touchscreens and Electronic Devices. 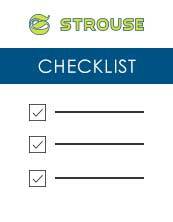 Strouse provides surface protection solutions available in custom sizes, shapes and formats. We can provide you products in the form of custom width rolls or custom cut parts on a roll, on a sheet of material, or as individual pieces. If you have a question about a project you are working on or think using surface protection tape can help protect your products, contact us today!